Many people treat medical conditions at home with needles, syringes, and lancets, commonly referred to as “sharps.” If you, your family, friends, or pets depend on syringes and needles, please spread the word—sharps must be disposed properly! Recycling and sanitation workers get stuck with needles when you don’t. And, when workers are stuck, they must endure months of blood testing and observation to ensure that no blood-borne diseases, like hepatitis or HIV, have been introduced. • Containers must be sturdy and unbreakable, such as laundry detergent jugs, bleach jugs, or coffee containers. • Containers must have a secure lid so that they cannot leak. To find out the regulations for sharps disposal in your state, visit this handy reference map. 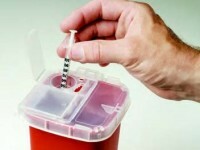 Then, follow these links to learn more about safe needle and drug disposal from the Food and Drug Administration and to see a list of their do’s and don’ts for safe sharps disposal.